Novak Djokovic’s 15th Grand Slam triumph has reopened the debate over who is the best men’s player of all time, according to Pat Cash. The Serbian ruthlessly dispatched Rafael Nadal 6-3 6-2 6-3 in the Australian Open final on Sunday to move within two major titles of the Spaniard. Who will finish career with most Grand Slams? With Roger Federer topping the all-time standings in men’s singles with 20 Grand Slams, Djokovic is now five behind the Swiss, regarded by many as the ‘GOAT’ – the greatest of all time. At 31, Djokovic has time to chase down that record, with Federer winning the most recent of his 20 at the age of 37 at last year’s Australian Open. “It’s not a popular discussion to say, is Novak the best of them all? It’s not popular. But you’ve got to face the facts, this guy might be the best of the lot of them,” insisted Eurosport expert Cash. Following his record seventh title in Melbourne, Djokovic heads to Roland Garros later this year targeting a fourth straight Grand Slam title. 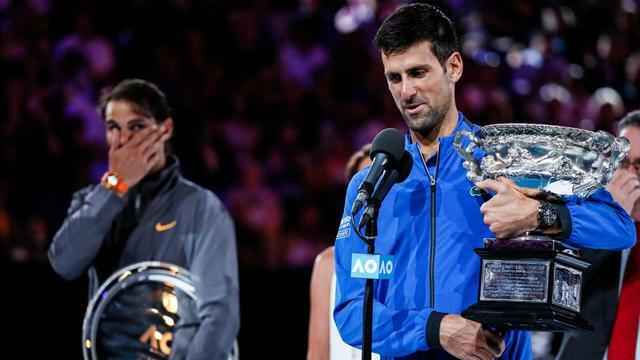 Victory at Roland Garros would give Djokovic a second Non-Calendar Year Grand Slam, having last held all titles in 2015/16, and Cash says he would have to be favourite for the tournament in spring. “You have to say that [Djokovic is favourite] but it’s a long clay-court season. The way he is playing he’d be favourite,” Cash added. “In the middle of this match I was wondering how is Rafa going to beat him on clay? It was a pretty quick hard court out there, it skids around and he can stand up and move the ball around. He’d have to do that a lot more times to beat Rafa on clay.